Peel and thinly slice enough onion to measure 1 cup [2 cups]; set aside half for the tomato sauce. In a large bowl, stir together the house dressing and half the sliced onion. Let stand, stirring occasionally, while you prepare the rest of the meal. In a medium sauce pot over medium heat, warm 2 to 3 teaspoons oil until hot but not smoking. Add the remaining sliced onion, season with salt and pepper, and cook, stirring occasionally, until the onion starts to soften, 2 to 3 minutes. Add the tomato sauce base and bring to a boil. Reduce to a simmer, cover, and cook, stirring occasionally, until thickened slightly, 2 to 3 minutes. Remove from the heat and season to taste with salt and pepper. Cover to keep warm. While the sauce simmers, start preparing the chicken. On separate plates or shallow bowls, season the flour and Parmesan panko with salt and pepper and spread in an even layer. Crack the egg into a shallow bowl and season with salt and pepper. With a fork or whisk, lightly beat until just blended. Working with 1 chicken breast at a time, dredge the chicken in the flour, turning to coat; shake off any excess. Dip the chicken into the egg; let the excess drip off, then gently press the chicken into the Parmesan panko, coating all sides. In a large frying pan over medium heat, warm 1 to 2 tablespoons oil until hot but not smoking. Working in batches if needed, add the chicken and cook, turning once, until golden brown but not yet cooked through, 2 to 3 minutes per side. Transfer to a plate. Add more oil between batches if needed. In a medium [large] baking dish, spread the tomato sauce in an even layer. Place the chicken on top and sprinkle with the Italian cheese blend. Bake until the chicken is cooked through and the tomato sauce is bubbling, 10 to 12 minutes. When the chicken is almost done, prepare the basil and the salad. Strip the basil leaves from the stems; coarsely chop the leaves for garnish. To the bowl with the onion and house dressing, add the kale and toss to combine. Season to taste with salt and pepper. Transfer the chicken Parmesan to individual plates and garnish with the basil. Serve the salad on the side. Stir the house dressing and onion. Season and spread the flour and Parmesan panko. 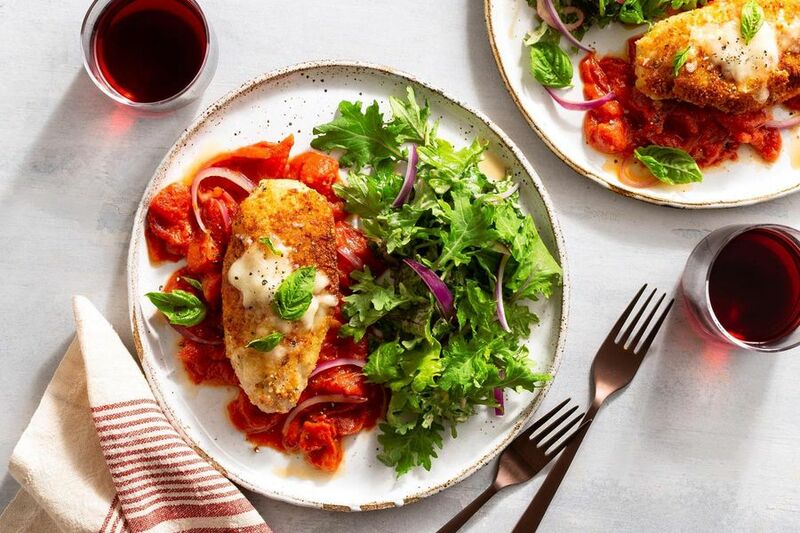 This Sun Basket riff on an Italian-American classic combines hearty, gooey, and satisfying with breaded chicken, fresh-cooked tomato sauce, and a green salad. An Italian invention, balsamic vinegar is a dark, sweet-tart vinegar made from pressed grape must—the same stuff that’s used to produce wine, except that it is not allowed to ferment. Instead, aged balsamic gains its character and complexity as it rests in successively smaller wooden barrels, each constructed of a different wood, for a total of at least 12 years. The longer it ages, the more moisture evaporates, concentrating the liquid and its flavors. Calories: 780, Protein: 51g (102% DV), Fiber: 6g (24% DV), Total Fat: 40g (62% DV), Monounsaturated Fat: 23g, Polyunsaturated Fat: 3g, Saturated Fat: 10g (50% DV), Cholesterol: 205mg (68% DV), Sodium: 820mg (34% DV), Carbohydrates: 47g (16% DV), Total Sugars: 10g, Added Sugars: 0g (0% DV).